FileAttributeKey.creationDate works exactly the same; .size and .type might also be of interest. This beautiful and elegant solution comes from this Stackoverflow answer and I wanted to save it where I’ll find it again. (I had not seen ‘return nil’ inside the catch block, but if you only care whether you’ve got a valid date, and don’t care about anything that might go wrong, that looks fine, and using the do catch block instead of _if let try?_ makes the code more readable and gives you a better clue where you might want to be more granular in production. 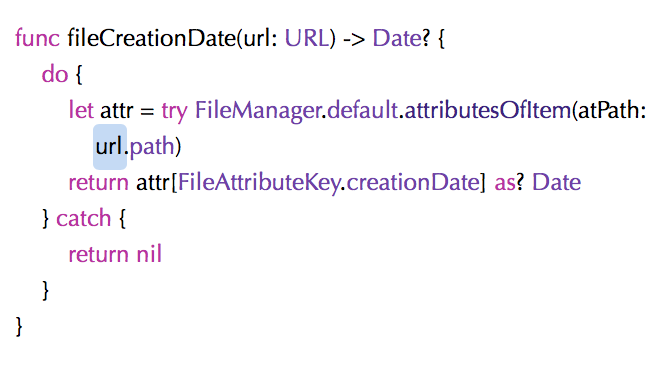 And having found this beauty I’ve worked out that – for reasons of my file structure, it makes more sense to store creationDate and modificationDate inside my filewrapper: you cannot get a URL for a filewrapper or its contents.